Steamed cauliflower is a wonderfully easy and nutritious dish—or a great base for other recipes—and is super easy. 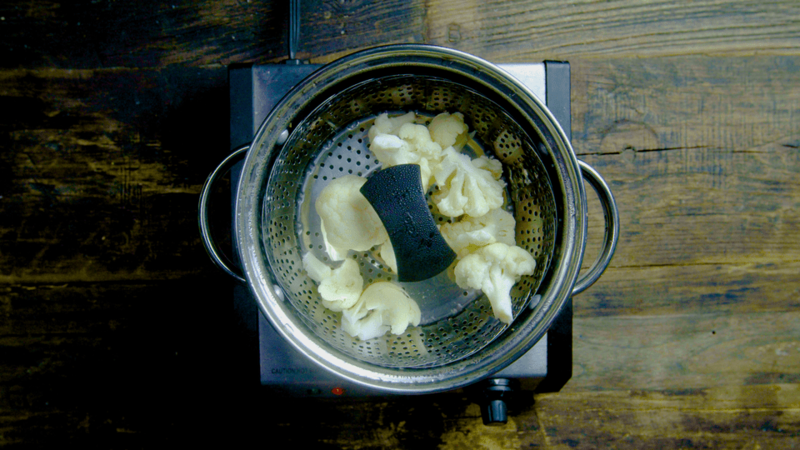 Steaming cauliflower can be done in a pan, with a steamer basket, or in the microwave. And once it is cooked, all you need to do is top with a sprinkle of salt and/or pepper, a drizzle of fruity olive oil, or a pat of butter to meld with its earthy flavor. Adding a bit of soy sauce or tamari is simple yet delicious, and a splash of toasted sesame oil brings out cauliflower's nuttiness. With so many delicious preparations to choose from, it is a good thing there are only three ways to steam cauliflower. Choose the best method for you. This is by far a favorite way to steam cauliflower. It involves one dish, real steam, and results in great tasting cauliflower. First, bring about 1/4 inch of water to a boil in a large frying pan. Add about 1/2 teaspoon fine sea salt and the trimmed and cleaned cauliflower florets. Cover the pan and steam until as tender as you like (about 3 minutes for crisp-tender and up to 8 minutes for completely cooked, soft florets). Make sure to drain any water from cauliflower before using. This is a classic method of steaming vegetables. The cauliflower is placed in a steamer basket or an insert over boiling water. To begin, bring about an inch of water to a boil in the bottom of a pot into which your steamer basket or insert fits. Then put trimmed and cleaned cauliflower florets in the steamer basket and set the basket over the boiling water. Cover the pot and steam until the cauliflower is tender to the bite, about 3 minutes for crisp-tender and up to to 8 minutes for fully tender florets. Steaming cauliflower in a microwave is certainly quick and convenient; however, it is definitely more difficult to get vegetables steamed to a precise and even level of doneness. In addition, cauliflower steamed in a microwave may require a bit of draining or drying depending on how much liquid is used and how powerful the microwave is. But if you'd like to give this method a try, put the freshly washed cauliflower florets with the water still clinging to them in a large bowl—a small pool of water should form in the bottom of the bowl quite quickly. If you don't see water in the bottom of the bowl, add a tablespoon of water. Cover the bowl with a microwave-safe lid or plate (avoid plastic wrap in microwaves) and cook on high power for 1 minute. Using a fork, test for tenderness and repeat microwaving at 15-second intervals until the cauliflower is steamed to your liking. If the cauliflower is quite moist when done, place between paper towels to dry. Steamed cauliflower can be eaten as is with just a little sea salt and maybe a drizzle of olive oil. But cooking this vegetable in this way is also ideal when adding a flavorful sauce or incorporating in recipes calling for cooked cauliflower. Consider adding a store-bought or homemade pesto to steamed cauliflower, or coating the tender white vegetable with a rich cheese sauce. Steaming cauliflower is the first step in recipes such as creamed cauliflower, cauliflower and cheese casserole, and cauliflower mashed "potatoes."